The final day of our brilliant #OleWinos trip was spent in a little appellation in the northern part of Spain, tucked in between still snowy mountains (if only we had that snow and rain in California! ): DO Bierzo (WL, FB, Tw). Our group was finishing up our stay across Spain, hosted by high end #wine group MGWines Group (WL, FB, Tw), in the small, but lovely & ancient, Roman-era town of Ponferrada. 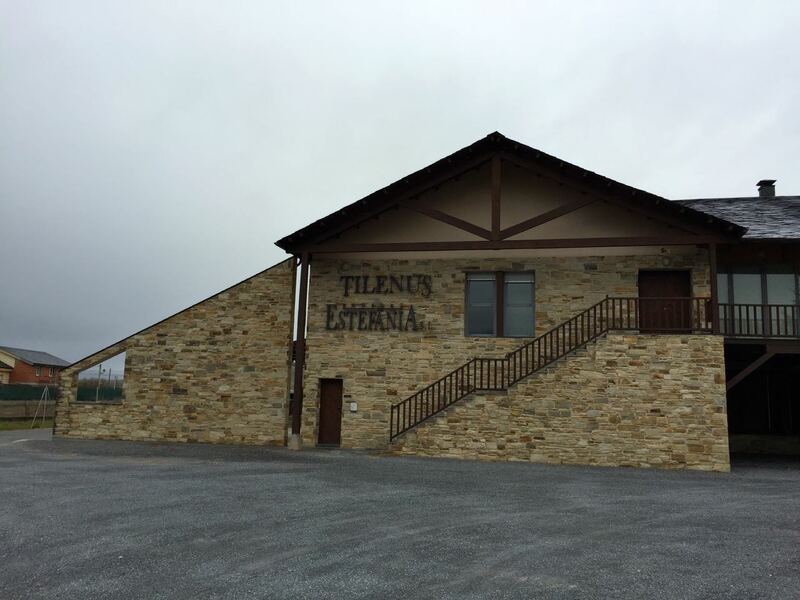 It was here that we would visit the previously known property of Bodegas Estafanía (WL, FB), now known better by its main label, Tilenus. 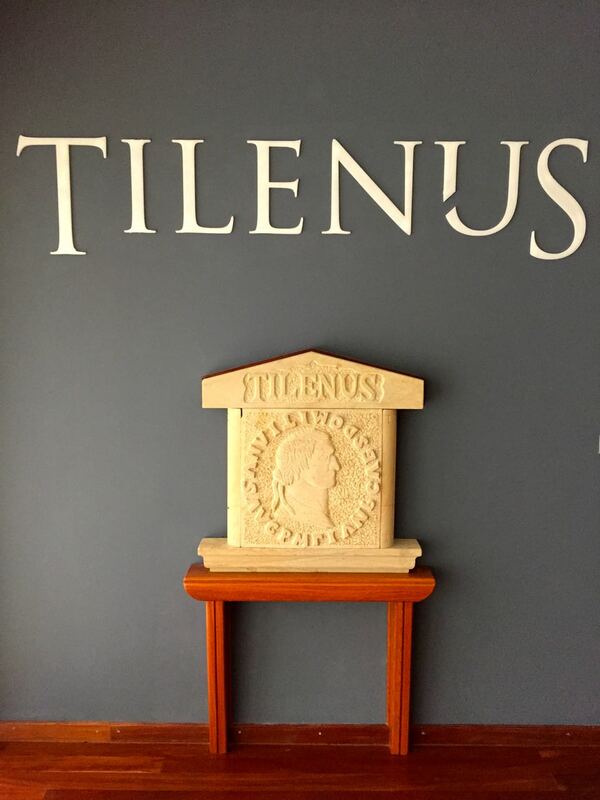 Named for the Celtic god, later appropriated by the Romans for their own Mars god of war, their label features a Roman coin that was once found in their very old vine vineyards. 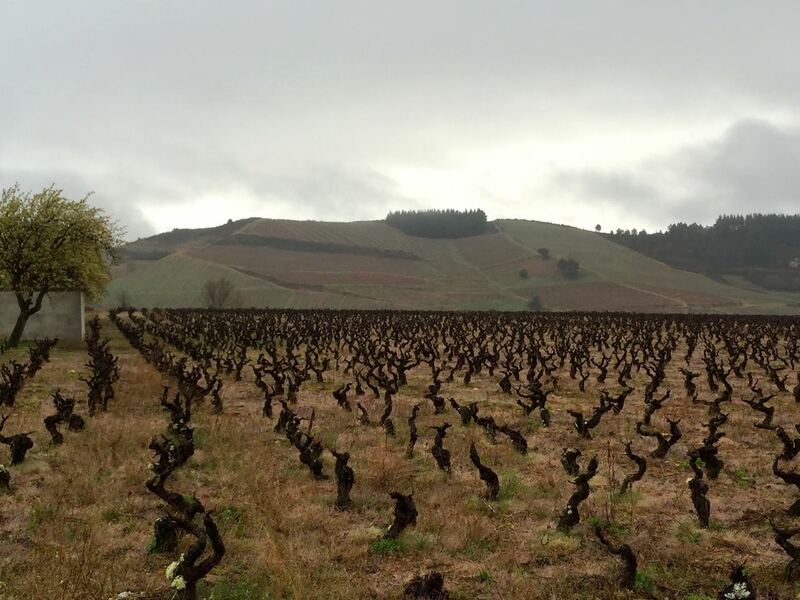 It is those very vineyards that sparked an image of ancientness themselves in my mind, with their Dantesque vine-hands reaching towards the sky, during our soggy visit to their longtime home. The Bierzo DO is made up of a lot of ancient, family-owned vineyard properties that have a similar Napoleonic inheritance process as Burgundy: each property is split into equal portions following the inheritance of the next generation. This results in a lot of small vineyards that still sit right next to each other. 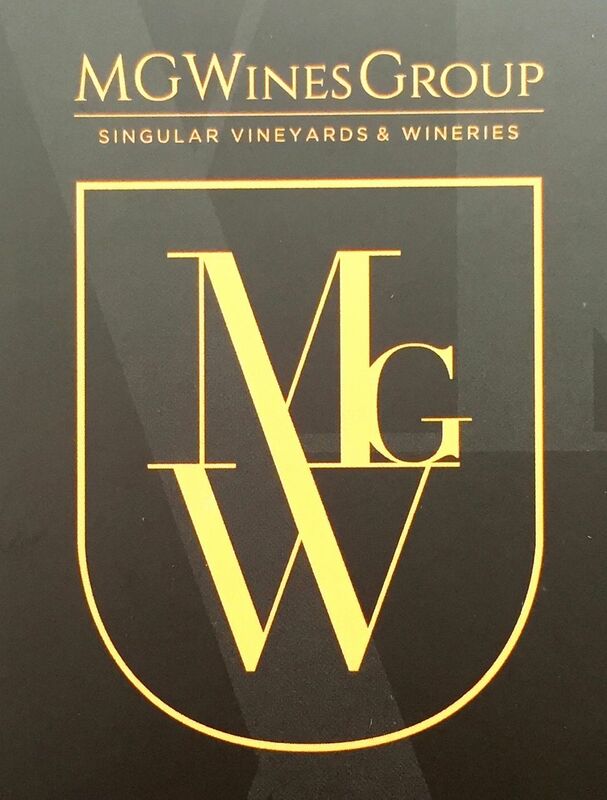 As such, MGWines sources fruit from both their own properties, as well as very select, old vine neighboring properties that share some of the same characteristics as their own estate vineyards, such as soil and vine age. Depending on how close you are to the mountains in the Bierzo valley, you will find sandy soil sitting on top of clay or slate. This has contributed to the lengthy life of these vines, as they have avoided the phylloxera plight of most of European vines, being protected by the mountains and in some cases, sandier soil. It is quite common to come across a head-trained, gnarly row of dry-farmed vines that were planted 60-110 years ago. These elderly vines produce a small amount of fruit, but it grows into tight, small berries with plenty of flavor concentration, savory characteristics and deep minerality. And the vines of Bierzo are almost entirely of one grape: mencía. Bodegas Estefanía is yet another beautiful jewel in the stable of MGWines Group. Originally founded by the local Frias family in 1999 in a former creamery, MGWines Group purchased the property last year and kept on our host, Pablo Frias as General Manager. Pablo is a stylish and tall Spaniard, dressed comfortably in a semi-hipster fashion, yet still functional for the winery work environment in which he’s developed his career. He is very well-versed in the property and its wines, and a wonderful, soft-spoken, well-humored ambassador for the brand. The winery has received extensive restoration and remodeling since its old days as a creamery. Clean, stylistic wood and concrete modern Spanish design still maintains the painstaking utility to produce minimally-handled fine wines, as seen at all MGWines’ properties. Gravity flow is enforced here as well, where they also hold onto their wines for 3-4 years before release in their “sleeping room” racked cellar. 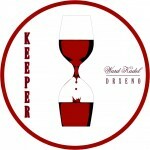 Once told by the then Bierzo Coop head winemaker that mencía would never make a fine, single varietal wine, Pablo’s father and uncle are now respected leaders of the mencía monovarietal movement that has been taking Bierzo and Scandinavia by storm, not to mention the US if you can find their wines. Twenty wineries in the DO ten years ago have now expanded to 72 wineries, as of March 2015, all focused mainly on mencía and the lone white in the Group, godello. Mencía, despite appearances after 4+ years of aging, is an extremely ageable grape variety. Many of the wines that I enjoyed below, as evidenced by the many WKBadges given out, showed color aging as early as the 2011’s. In some ways they reminded me of garnacha, including it’s medium weight and acidity. Yet, these wines feature a lot more savory complexity than many garnacha, along with their shared floral notes, and mixed mainly red fruits that complement their good acidity. Mencía does have a slightly smoother mouthfeel and fuller tannin, however. Based on our historical tasting of wines from the property, even the Tilenus Bierzo Godello can age well, not just their well-priced mencía varietal wines, at all price categories. 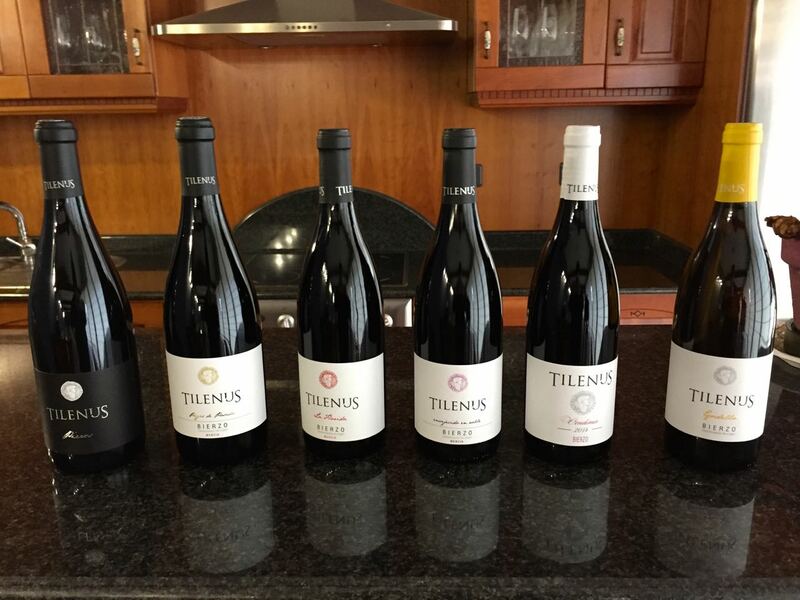 Seek these Tilenus wines, and all Bierzo DO vino, near you, they are worth the affordable price! 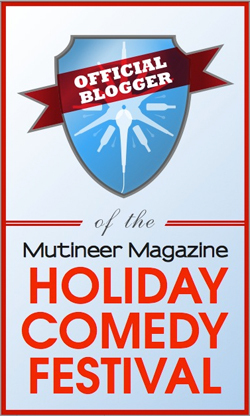 A giant thank you goes out to our hosts, MGWines Group and Kraynick Consulting. You can find all of our #OleWinos content on Twitter, Facebook and Instagram. The photos are posted at the #Vinopanion Facebook page and the wines reviews at WineLog. You can read the MGWines Group blog post about our trip at their site, as well. Color: Dark garnet in the core, with garnet on the edges as well, slight brick. Nose: Good earthy & meaty nose here, with all dark black fruit and flinty toasted notes. Palate: Very nice smooth and full mouthfeel here, then cherry liqueur comes in, deep and ripe. 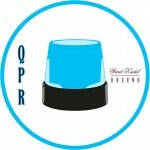 Flinty, floral oak comes in towards the good and long finish that is more savory and with finer tannin and great acidity: QPRWK. Palate: Big mouth here, more coating tannin, then all of that ripe plummy fruit arrives, with more toasted graham into the full, toasted, powerful finish, with more tannin: KeeperWK. Color: Very dark rust colored sediment core, rust edges. Nose: Huge black plum here, with some raisin and mocha aromas. Palate: Big juicy plum here as well, distinct pencil lead and flinty earth, with cocoa and big tannin structure. Cocoa into finish with some sweeter toast as well. Continues to open with air, and gain forest floor: KeeperWK.